Why are we changing the way we bill for sewer collection? A rate study recently completed by MetroConnects concluded the existing MetroConnects’ rate structure needed to increase to cover the costs of maintaining the sanitary sewer system in good condition and to fund MetroConnects’ capital plan. The new recommended rate structure is more consistent with industry best practices and provides a more equitable billing method for continuous asset rehabilitation and quality sanitary sewer service while protecting public health and the environment. The MetroConnects sewer service charge will have a base charge of $11 per month as well as a volume charge of $1.54 per 1,000 gallons of water used. The rate structure is the same for all customer types. 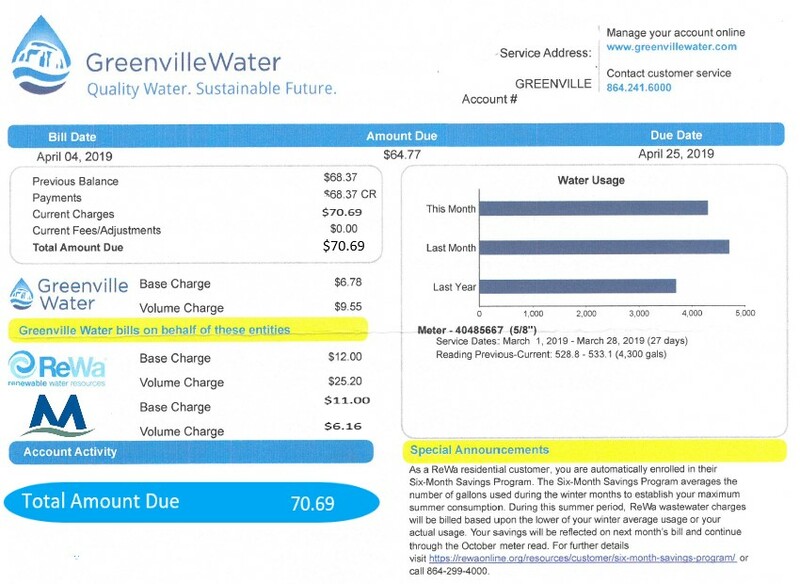 The new charges will appear on your monthly Greenville Water bill. The fixed charged will cover costs related to billing and collections, as well as account management. The volumetric charge is related to customers’ actual water consumption based on your drinking water meter only. If you have a separate irrigation meter, that usage is not included in your volumetric charge. The billing through the water system eliminates the taxes collected through Greenville County Property Tax Bill. MetroConnects has not increased rates (the sewer fee and taxes collected) since 2010. Over the last 20 years, MetroConnects has invested more than $30 million in the sewer infrastructure throughout its systems in Greenville County. MetroConnects primary goal is to ensure your sanitary sewer system is in good operating condition. Only customers connected to MetroConnects’ sanitary sewer system will be billed. What does the rate increase cover? MetroConnects owns and maintains the sewer lateral to the property line. See diagram.